Microgaming has over 20 years of experience in the online gambling industry and this in itself is one of the reasons why they continue to be named the top casino software provider. They continue to grow and respond to new advances in industry technology. They were one of the first to embrace the mobile gaming market and they make all their slots available for all operating systems. For a long time, Mac users were left out in the cold because they couldn't download casino software. Now there's an instant play option with no download required that allows Mac users to enjoy all the great online casino action that Windows users have enjoyed for years. Microgaming offers a no download instant play version of their software for Mac users and those that don't want to download software. There are hundreds of great games to choose from and they all run in your browser making them accessible to all gamer types. There are hundreds of Microgaming slots for Mac players to choose from, including branded games. What's more, here at Grizzly Gambling we have free demo versions of a lot of these slot machine. All our readers can enjoy free Microgaming slots with no download and no registration required. All the games are instant play and will run in your browser so you can test them and see how great they are before you decided to play for real money. Below you will find information on our top 3 featured Microgaming slots for Mac users as voted for by our readers. 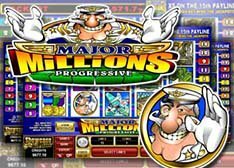 Major Millions: This is one of Microgaming's progressive jackpot titles and it comes with a 89.37% RTP. It is available in a 5 reel and 3 reel version and the jackpot seeds at 1 million. To play for the progressive jackpot, you have to bet the maximum amount which is 3.00 per spin. This is a military themed game that includes an assortment of military-based symbols. There are some great bonus features included in this game and players can also choose to play in Expert mode. The progressive jackpot meter is displayed at the top of the screen so you can always see the jackpot you're playing for. The Explosion symbol is the scatter and three or more of these gets you a cash prize. The wild symbol is the Major Millions Progressive logo and it can substitute for all other symbols to help create winning combinations which come with a 3x multiplier. If you get 5 wilds you win 8,000 coins which is the largest jackpot in the base game. This is a fast, fun game and you can try it free here today. 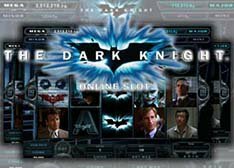 The Dark Knight: This is a 5 reel, 243 ways to win slot based on the movie of the same name. It also has a progressive jackpot and features Batman and The Joker who give out random rewards. There are plenty of great features included in this slot such as free spins, multipliers, and bonus rounds. Spins start from as little as 0.30 up to 6.00 per spin and the top jackpot is worth 4 million coins. Clips from the film are included in the game and you get to see them when you get a winning combination. In the base game, Batman and The Joker appear randomly and offer great rewards such as cash prizes, wild symbols, and wild reels. The Joker scatter symbol triggers the free spins bonus when you get 2 of them anywhere on the reel. This rewards players with 15 free spins with a 2x multiplier. There are also 4 progressive jackpots up for grabs too and entry into one of these is triggered randomly. One you get into the jackpot round you will need to choose between Batman and The Joker and spin the jackpot wheel. This is a fast paced, exciting slots game that is well worth a try. Break Da Bank: Break Da Bank and Break Da Bank Again are two very popular slots from Microgaming. In the first version, there are 3 reels and 5 pay lines and spins start at 1.00. This version comes with wild and multipliers and the maximum jackpot is 2,400 coins. The theme is money and there is plenty of green in this slots game. 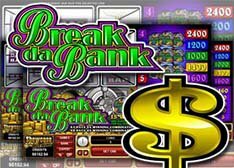 Break Da Bank again is a 5 reel, 9 payline video slot and continues the same theme as its predecessor. This game includes a wild and scatter symbols and comes with a free spins bonus round that offers players 25 free spins. To trigger the free spins bonus round you need to get three or more Safe symbols. All the free spins come with a 5x multiplier too making it very popular and lucrative. There is also a gamble feature included in this game and players can choose to gamble their wins to be in with a chance to double them. Break Da Bank Again is the preferred choice with players and it has the potential to award some huge wins too. Microgaming is renowned for their excellent slots and guaranteed fair gaming. Their software holds the eCOGRA seal of approval and casino operators love this. They offer a no download instant play software option which is perfect for those with Macs and mobile devices and those that don't want to have to download any software. You can try out our free Microgaming slots for as long as you like and if you choose to play for real money we recommend the Jackpot City casino 20 free spins no deposit bonus for Canadian players. Jackpot City is an excellent online casino with a great reputation and as well as a no deposit bonus, they also offer a $1,600 Welcome package of 100% up to $400 on your first four deposits. Returning players can enjoy some of the best promotions around including reload bonuses, free spins, cash back offers, and more. Be sure to check out our review for more information.